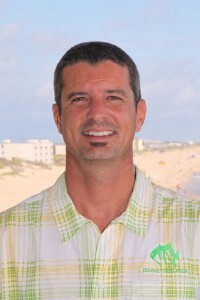 Mike Remige is director of Jennette’s Pier in Nags Head, which is part of the North Carolina Aquariums Division in the N.C. Department of Natural & Cultural Resources. Jennette’s Pier is a marine education center, scientific research platform and public fishing pier located in the Whalebone Junction district of Nags Head on the Outer Banks. A graduate of St. Mary’s College of Maryland with a degree in biology, Remige joined N.C. Aquariums in 1997. He led the original development of the pier into an educational facility from 2003 to 2005. He also coordinated the state’s oyster hatchery program and was an aquarist at the N.C. Aquarium on Roanoke Island. In addition, he has served at the University of North Carolina’s Coastal Studies Institute as a research technician in the Department of Estuarine Ecology and Human Health and the Department of Coastal Processes. In his free time, Remige enjoys surfing the miles of empty Outer Banks beaches with his friends whenever the opportunity arises.